Part of the typical pre-season lacrosse prep is pulling out equipment, checking everything over, and giving it a good cleaning. If you plan on applying decals or a lacrosse helmet wrap this season, it is especially important to start with a clean helmet. Last seasons, dirt, sweat, and body oil can all act as a barrier between the helmet and the adhesive of the decals. These contaminants reduce the stickiness and make the decals more likely to peel back at the edges as the season progresses. What is the best way to clean a lacrosse helmet? 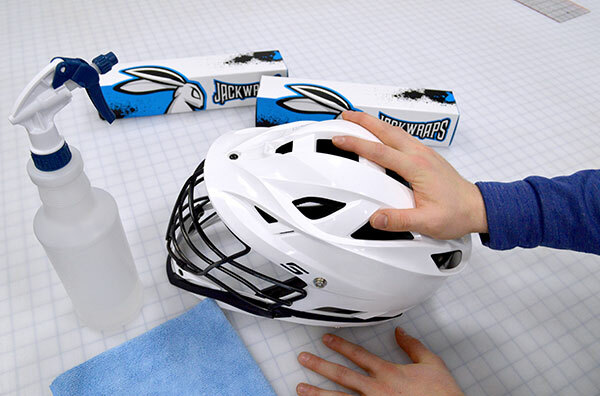 The most effective way to clean a lacrosse helmet is with some good old soap and water. Grab a clean towel, get it wet, and start scrubbing. Simple elbow grease will get most things off. You can add a little dish soap to tackle more stubborn areas. If there is a dirt clod that isn’t coming off easily, leave the damp towel on the spot to saturate it and then try again after a few minutes. Adhesive residue from old decals, grips, or other tapes, may require something a little stronger. Here in the shop, we sometimes use Goo Gone or another adhesive remover. Use a sparing amount and let it soak in. The residue can then wiped away with a paper towel. If all else fails, try a Mr. Clean Magic Eraser. A lighter touch is needed when using this product as it will remove the helmet model logos and warning label if you are not careful. This product should not be used on helmets that feature a manufacturer-applied pattern such as carbon fiber. After any chemical product is used, it is a good idea to give the helmet a thorough cleaning with soap and water. Can a helmet be cleaned after decals are applied? Of course! The decals that we use at JackWraps® are heavy duty and durable. If our decals can stand up to repeated hits and knocks, a light cleaning won’t hurt anything. Avoid using adhesive removers or aggressive soaps. A clean, damp towel should do the trick. What if one of my helmet decals starts to peel at the edges? If you have a decal that starts to peel at the edges, start by trying to smooth it back down with your hands. If it continues to peel back, we recommend making a clean cut along the peeled edge with a utility knife. This will help prevent a small edge peel from getting worse. If the problem persists, contact the manufacturer. JackWraps® always tries to remedy the situation immediately. This might involve sending a replacement for the problematic decal or an entire new wrap if necessary. We sell decals and wraps intended to last for an entire season, not just part of it. We stand behind our product as we would hope other manufacturers would. JackWraps® offers a full range of lacrosse decals from traditional side decals and stripes to our specialty, full custom helmet wraps. Reach out today to speak with one of our reps. We would be happy to get started on a custom design and quote for your team.